As a Life and Leadership Coach, people come to me for support around achieving results. 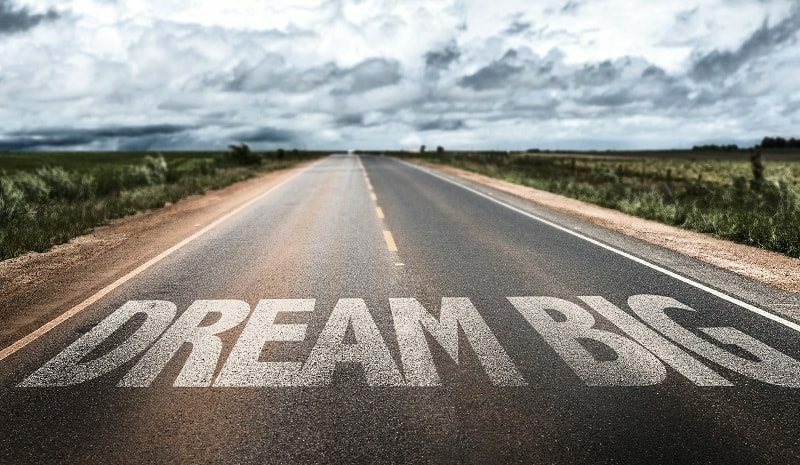 Maybe it’s a goal that seems impossible, or a desire that seems out of reach, no matter how hard they’ve wished for it or how many steps they’ve already taken. Sometimes, they know they could get there on their own. But they have an inkling that perhaps they’d get there faster or with less anxiety if they had some support, as well as a shift in perspective. My clients come from all over the world and from all walks of life. But there’s always ONE common denominator: wherever they’re going, it’s outside of their current comfort zone. Like anyone who has ever made a New Year’s Resolution knows, it starts off with a bang – a big declaration, maybe some bold actions, and the best of intentions. Just as our eyes can be tricked into believing that cubic zirconium is a diamond, our brains can be fooled into thinking the comfort zone is truly safer than whatever is out in the unknown. This is where we typically stall or stop. What exactly is your comfort zone? It’s the familiar – the default setting of your life. Just because we call it the “comfort zone” doesn’t mean it’s actually comfy-cozy, though. Sometimes, it’s a painful or counteractive place to be. But we’re so used to living there that we don’t even notice it anymore, or don’t believe we have the power to change it. 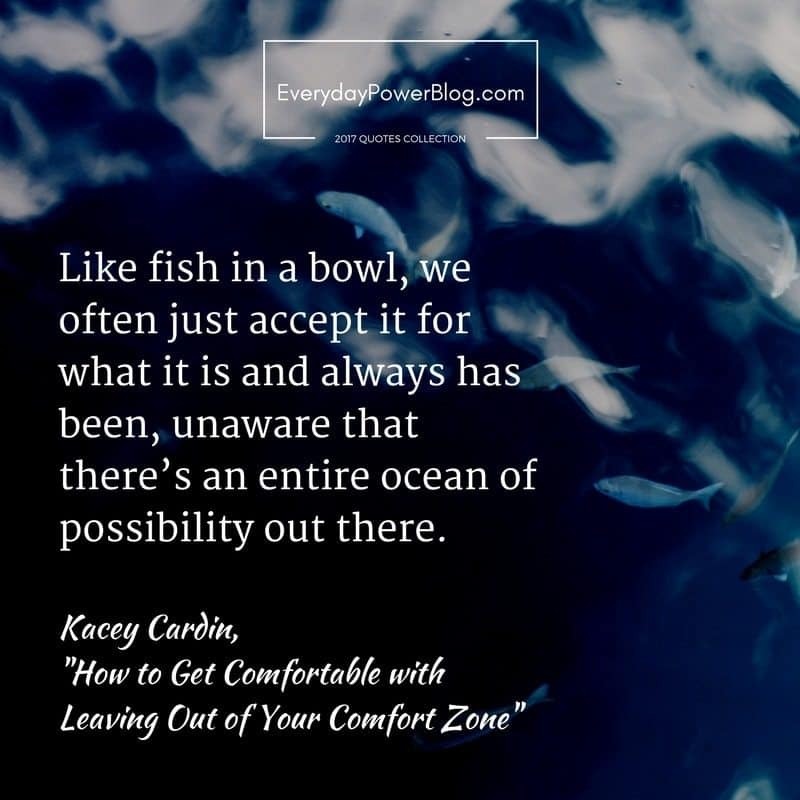 Like fish in a bowl, we often just accept it for what it is and always has been, unaware that there’s an entire ocean of possibility out there. For some of us, it looks like always going out of our way to make others comfortable, even to the detriment of our own health and well-being. For others, it looks like constantly playing defense, certain that the world is an unfair place full of people who will inevitably hurt or leave us. Your comfort zone might revolve around certain feelings, particular behaviors, predictable reactions, or a familiar cast of characters (both internal and external). Your comfort zone isn’t inherently good or bad. However, if you are striving to create results that are new, unpredictable, or to a higher level, you’re going to be required to step out of your comfort zone to create what’s next. So, how do you leave out of your comfort zone and avoid jumping right back into it?! 1.) Have a “Get to Know You” meeting with YOURSELF. It’s crucial that you identify your comfort zone so that you can practice consistently choosing the possibility that exists outside of it. The paragraphs above give you some great places to look: your feelings, automatic reactions to people or situations, typical thought patterns and behaviors, etc..
A coach can help you take a non-judgmental look at what’s automatic, what works, and what doesn’t work so well for you. 2.) Get real: What’s the big deal?! What is your big “What for?” How will achieving this goal actually change your life? Sometimes, we set goals based on things we “should” want, be, or do. But ultimately, this often leads to false starts or unfulfilling results. How does the goal line up with your highest values, and where did those values come from? Your heart? Your brain? Society? Your parents? Asking yourself these “why?” questions can help unlock some answers when you get confronted or stuck on your journey. If you consistently find yourself stuck here, remember that sometimes, we’ve drowned out our inner voice for so long that it’s hard to hear ourselves. This is another great reason to hire a professional coach who can provide reflections and feedback gleaned from YOUR inner wisdom. 3.) Take a cue from Shakespeare. Ask yourself “What’s my motivation?”As a coach with a background in theater, I’m amused at how often this question resonates. It’s just as important in the dramatic arc of your life as it is to a character on stage or screen! GET REAL as to why it truly matters for you to take the leap out of your comfort zone. Are you motivated by an internal desire, a higher calling, or are you trying to impress someone else? Are you more motivated by consequence (or not suffering any longer), or by reward or achievement? Once you identify what gets you going, be sure to create ways to remind yourself of whatever “Your Thing” is. Get clear on why you’d embark on an adventure into uncharted personal territory. Otherwise, you won’t have sufficient resistance to keep you from turning back toward the comfort of “home”. 4.) Have a little compassion for yourself! 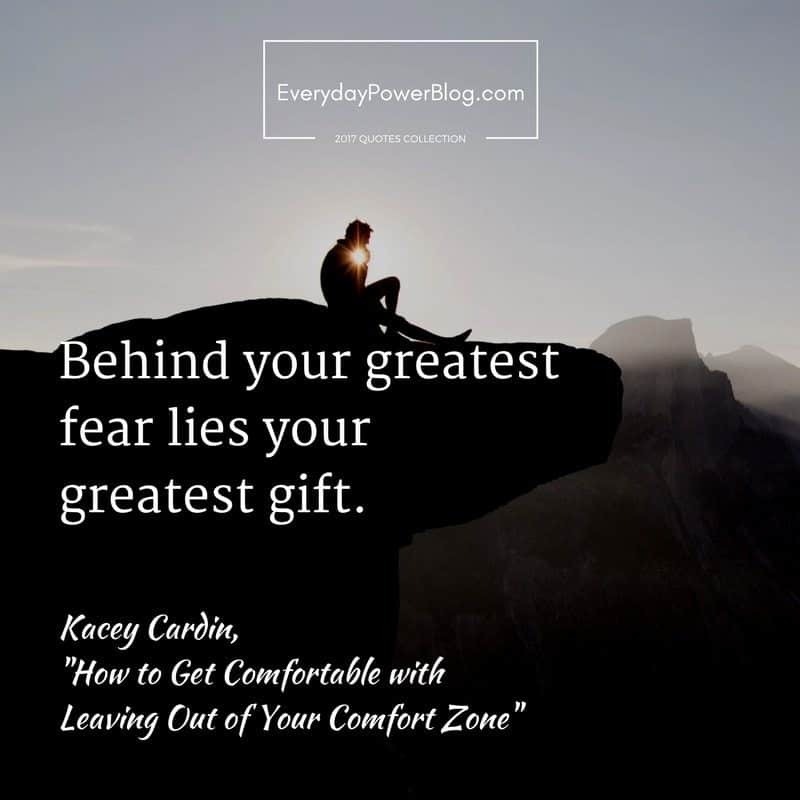 Actually, more than a little – you’re taking on the courageous act of leaving out of your comfort zone that your amygdala deems safe and comfy! Your system will be on red alert as you leap into the unknown. And your inner child, inner critic, and inner demons will all be throwing their own tantrums about it. Stay present to the fact that the adult, empowered YOU made a brave choice. Continuously give yourself the love and encouragement that you’d give a frightened child or a small animal. In short, learn to be your own biggest fan and your own parental figure or boss. You are, after all, the CEO of your own life. Cheer yourself on. Know when to rest, and choose to truly take exquisite care of yourself. You wouldn’t build a house without a blueprint and some scaffolding, would you? You are the architect of your own possibilities, my friend. So be responsible for laying a sturdy foundation (consider your well-being and health as a crucial part of that). Then take the time to identify what structures will sufficiently support the dream you’re building! Who else is on your team? Who is holding you accountable for continuously moving forward? Who will help you dismantle roadblocks? What (or who) are the likely culprits of delay or sabotage? How will you detour around those? How will you reframe the old ways of thinking to finally get out of your comfort zone? Celebrate the wins, small and large! Train your brain to celebrate even the smallest successes as you get out of your comfort zone. Often, we approach possibility from an all-or-nothing standpoint. You will most likely have some hiccups along the way. 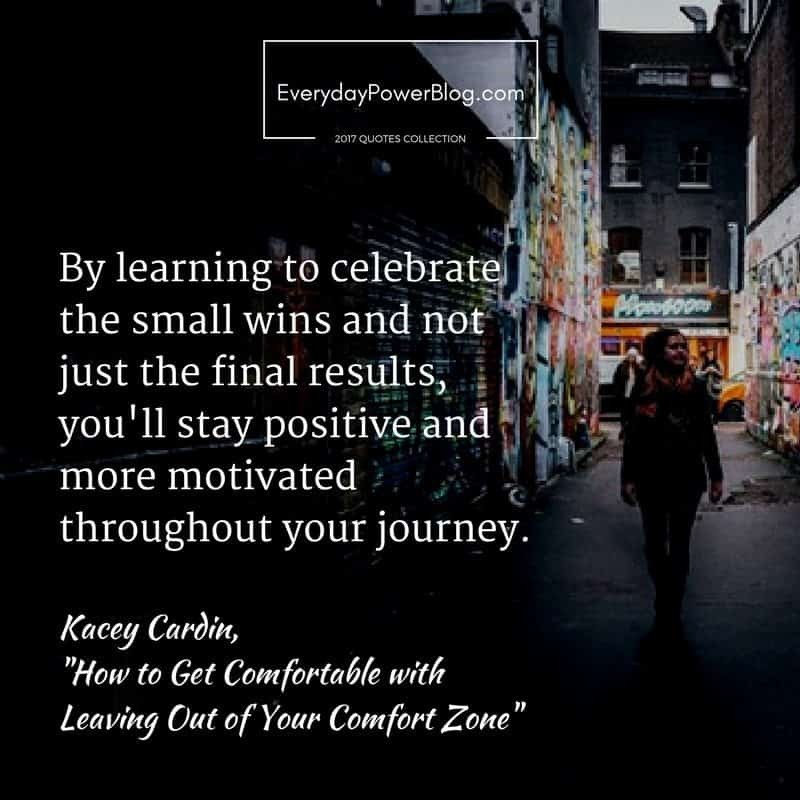 But by learning to celebrate the small wins and not just the final results, you’ll stay positive and more motivated throughout your journey. I have my clients match small, medium, and large rewards to their corresponding milestones and mini-breakthroughs. This is so they are consistently encouraging themselves to keep striving for the finish line. Notice that these steps build on one another: you can use the info you discovered in steps 1-3 to create a personalized and meaningful rewards system! You don’t have to do it all by yourself! Be vocal about your goals so that not only are you held accountable by people who will ask how things are coming along, but also so that you’ve got a cheering section. That said, note that while your friends and family might be great cheerleaders, they are also used to you in your comfort zone. This means that when you begin to change your life, it might disrupt their comfort zone. This can be a source of conflict in relationships. It might also mean that they’re too close to be brutally honest with you about what discrepancies they notice between what you say you’re going to do, and what you actually, consistently do. This can lead to doubt, disinterest, or lack of ongoing support should you run into setbacks. Not to sound like a broken record, but this is another reason why professional coaches are invaluable! So, don’t give up. Ready to finally get out of your comfort zone? My job is to help clients identify new possibilities and stay the course as they leave the comfort zone and create what’s next. I can tell you without question that fears and setbacks are absolutely normal and predictable. But they aren’t stop signs! Consider that behind your greatest fear lies your greatest gift… give yourself the green light to fully go for it. Thanks for reading and for having the courage to take a leap into your own infinite possibility. Don’t hesitate to reach out, or to create a more detailed Comfort Zone Support System of your own!